It’s finally here. This is the one you actually meant to get for twenty bucks on eBay just in case, for reals this time! The Red Goblin makes his first full official appearance in the Amazing Spider-Man #798. Does he live up to the hype that we the audience have built? Does he even live up to the hype that the book has built? Let’s get into it. Mild spoilers coming. The Red Goblin, I have to admit, is pretty scary. However, I feel like he was scarier before he went full on R.G. and was just a silhouette of Norman biting the head off a rat. Though we really only do get just a little more than a tease in this issue, because Spider-Man rightfully knows he can’t beat him in a normal fight. He very quickly surrenders to him and is forced to take the fight in the next issue under the radar, presumably to assemble the crew of symbiote repellants on the cover. Some people will like this approach, because it could highlight just how formidable the Carnage + Goblin combo is. Others might feel it’s a case of telling and not showing, and a little anticlimactic for Norman to seemingly back off after Spidey throws up the white flag, or the torso of his suit, as it were. I’m somewhere in between. 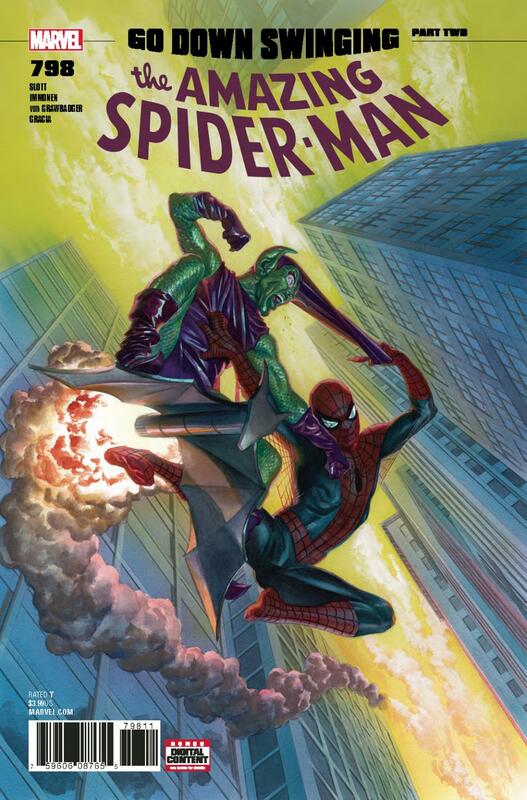 The rest of this issue is a much anticipated reunion with the regular old Green Goblin being his usual self. Bombs, bridge threats, crashing in threw the window. That sort of thing. I’m sure many will be left raising an eyebrow like I did at the very questionable way that Spider-Man contains the explosion of the bomb. Stuart Immonen and Wade von Grawbadger are undeniably strong assets. Especially in Jameson’s plea for strength, the attention to detail in faces is astounding. There are no two characters who look even remotely alike, and their thoughts are depicted clearly, realistically, and they’re relatable. Unfortunately, the script doesn’t really give them the chance to show what they can do with a fight, so instead the focus is put on what they can do with the Goblin’s stature and his naturally menacing look. Marte Gracia adds to darker environments a very tangible sense of depth through well-mimicked shadows and lighting.